The Battle of Budapest (October 29, 1944 till February 13, 1945) was a great battle of WWII. The victory paved the way for liberation of Hungary, destruction of the Hitler’s coalition in Europe and blockade of German forces in the Balkans. For Germany the withdrawal from Budapest was tantamount to the loss of access to the Lake Balaton (Nagykanizsa) oil reserves that accounted for 4/5 of the oil consumed by Germany to support its war effort. Having won the battle of Budapest, the Soviet troops could advance to Vienna and southern regions of Germany while the Hitler’s forces in Italy, Yugoslavia, Greece, Albania faced the risk of being cut off from the avenues to retreat. The Soviet 2d and 3d Ukrainian Fronts were confronted by German Army Group South, part of Group Center and the army of Hungary, the last ally of Nazis in Europe. The enemy forces numbered around 190 thousand men. Three well-fortified lines of defense were built around the city stretching all the way up to the Danube shore. The city itself was converted into a strongly defended fortress. The Soviet troops began their offensive in the eastern suburbs advancing through Pest and making good use of the large central avenues to speed-up their progress. The German and Hungarian defenders, overwhelmed, tried to trade space for time to slow down the Soviet advance. In January 1945 the Germans launched a three part counter-offensive codenamed Operation Konrad - a joint German-Hungarian effort to relieve the encircled garrison of Budapest. By the end of January the counter-offensive exhausted itself. It became clear that the attempts to restore the defensive positions or break through the encirclement were doomed. 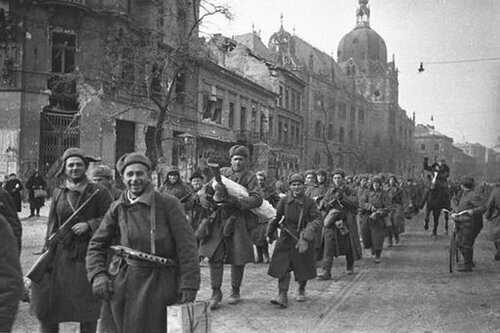 The Red Army entered the city defended by strong garrison of German and Hungarian forces. Well-equipped and well-trained SS units bore the brunt of the fight. In some parts of defensive positions Nazis concentrated as many as 50-60 tanks per kilometer. The Hungarian capital was encircled. Hitler ordered Obergruppenfuehrer-SS Karl Pfeffer-Wildenbruch to fight to the last. The storm started on December 26, 1944 to continue for the next two months. For comparison, Berlin was captured in two weeks. SS divisions Maria Theresia and Florian Geyer were almost eliminated defending the besieged Budapest. In February 1945 they made the last attempt at breakthrough. Only 785 out of 50 thousand made it through the encirclement! 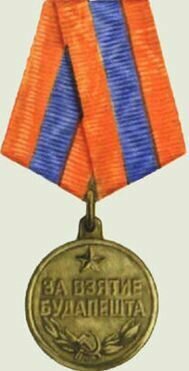 It was a really fierce fight, one of the bloodiest battles the Soviet Armed Forces fought to liberate a city. Budapest is one of the most beautiful places in Europe. The Red Army did its best to spare the city’s historical places from damage. Before the battle for Budapest started the provisional government of Hungary addressed Hungarian soldiers who fought side by side with fascists. It read, «Soldiers! You have no other order than the order of nation! In the name of Hungarian nation the Interim National Assembly orders you to turn the weapons against German oppressors. Help the Red Army – our liberator, join the people and the new national armed forces formed to fight for freedom». The call was heard. The Hungarian military switched sides to join the Red Army. They formed the Volunteer Regiment of Buda under the command of Lieutenant-Colonel Oszkár Variházy. In the fight to free Buda it lost 600 men. There were 34 guerilla formations operating on the territory of Hungary (the first anti-fascist guerilla groups appeared in the second half of 1941). Hungarians fought fascists in other countries, including Ukraine and the north of Moldova. 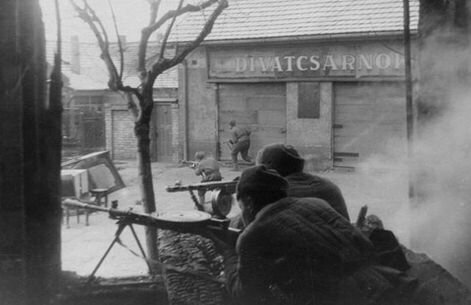 Around 800 Hungarian guerillas and 1200 Hungarian soldiers joined the ranks of insurgents and took an active part in the anti-fascist insurgency in Slovakia. On April 6, 1945 Béla Miklós, the acting Prime Minister of Hungary’s Provisional National Government, sent a telegram to Josef Stalin. In the name of Hungarian people and government he expressed gratitude for liberating the country. He wrote that Hungary formed a new army. Miklós wanted it to be given a chance to join the final fight against the Nazi monster. In February-March 1945 the Soviet Union granted the provisional government a loan of 950 pengő (the currency of Hungary) on favorable terms. Later it added 100 million pengő to it. The Soviet soldiers rebuilt 65 % of Hungarian railways, as well as many roads and bridges. They cleared streets and houses of mines and repaired many railroad cars. The Soviet Union lost over 320 thousand men in the operation to free Budapest buried in 900 cemeteries across Hungary. The battle of Budapest was a great success. It paved the way for the 2d and 3d Ukrainian fronts to move to Czechoslovakia and advance to Vienna, the capital of Austria. It put an end to the existence of alliance between Nazi Germany and European states with fascist or pro-fascist regimes.